I LOVE tea. Really love tea. Especially Earl Grey. My tea ritual starts before I go to bed. I make sure the tea pot is rinsed out and the kettle full. That way all I have to do is hit the button on my electric kettle as soon as I get out of bed. While the kettle boils I usually check Instagram for the overnight feed and try not to munch on any cookies that might be leftover from the previous day's baking. When my tea is ready I settle in to catch up on the world and start my day's work on the computer. If I have writing to do I like to jump right in. Otherwise I sip and browse the world from my laptop. All of this, implies that I am getting a quiet, lonely start to the morning. If I sleep in or have to get up and do things with the kids right away I do not make my tea. I love the ritual almost more than the caffeine so I wait. And if that moment never comes I do the next best thing at some point in the afternoon - I make a London Fog. I discovered London Fogs years ago at some random coffee shop. Seeing as I don't drink coffee I am always aware of my other options. When the barista suggested a London Fog after I hesitated on the default hot chocolate, I nearly turned him down. But then he used the words vanilla and Earl Grey in the same sentence. And done. That being said, I don't often order them when I'm out. The vast majority of places - chain or independent - make a London Fog with vanilla syrup. This results in a drink that is too sweet for my liking. Instead, I save my London Fogs for afternoons spent stitching or painting with the kids. For the random moments I get alone in the winter sun. For my leftover Earl Grey (sacrilege, I know). For every cup you make add a teaspoon of vanilla extract and a teaspoon of honey. I'm sending this to Laura, she's the tea drinker! Mmmh, that sounds lovely! I''m a tea-only-drinker too, and me too, I find it difficult to find something appropriate to drink, when having a break away from home, because I love my loose leaf teas. Huh, that sounds nice. I might try that! This is how I like my London Fog too but I skip the honey (I'm sweet enough) and add a few drops of lemon... yum!! Early grey or Afternoon London Fog, I really love the new option here! I too prepare for my holy moment over a steaming cup and in the silence of my home. Oh, what a difference it makes in my mood for the day. London Fog tea sounds so yummy! I make what i like to call a dessert tea ~ it's Yerba Mate with a few drops of liquid stevia, boiled almond milk and vanilla extract. You could use honey and milk too! When I'm out I usually ask for half the amount of syrup in whatever coffee drink I'm having. It's much better and less sicky-sweet. I'm sure you could do the same for tea! I love a good cup of Earl Grey. I have been drinking Harney's Indian Spice for quite awhile and now I have something new to try. Maybe tomorrow morning! Thank you. Yum. I'm an Earl Grey girl like many here. Recently tried French Vanilla creamer and it was ok but a bit too sweet. Will give your recipe a try today. tried this today am drinking a cup as I type. delicious. this is similar to how my indian friend makes chai tea. she takes the tea bags (tea india) and puts them in a pot of milk and sugar and then simmers it all up till it's rich and frothy. Do you have David's Tea out there? They make a loose leaf 'Cream of Earl Grey', it's so perfect for making London Fogs. 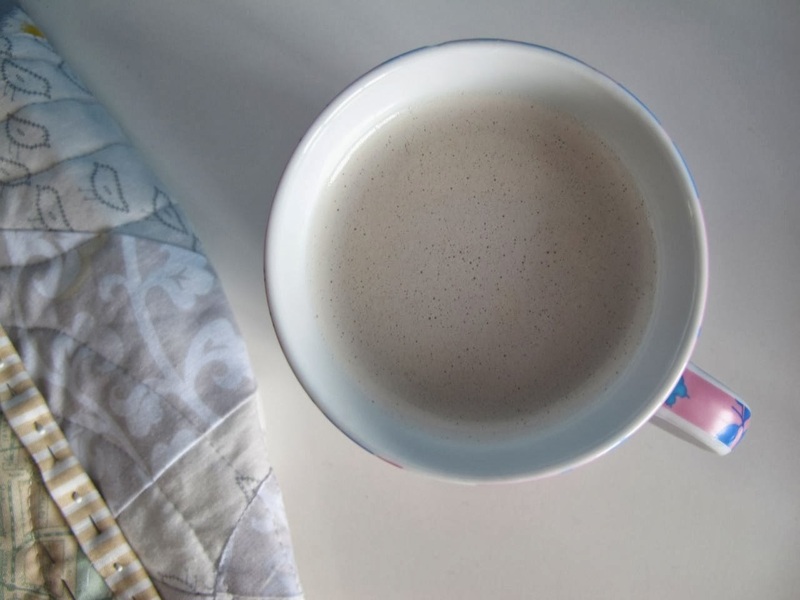 I'm so glad you posted this, I used to make this for myself back in college and forgot about it completely - I've starting drinking it again and it is heavenly! And a nice treat for when I want something sweet and milky but not as intense as hot chocolate (which is my usual go-to). Yummm! Have been trying to eliminate coffee (somewhat!). This sounds good. Oh, I just tried this - so delicious! Thanks!